notification has released on 06-01-2018. Candidates with essential eligibility criteria are advised to go through the www.aurangabadmahapalika official website to get the application form. Fill the application form and carry at the time of Interview along with necessary documents. Candidates will be selected for Staff Nurse, Medical Officer vacancies based on performance in interview held by National Urban Health Mission Aurangabad. Walk in Interview will be held at given address on 19th & 20th January-2018. Full details regarding Pay Scale, Qualifications, Age limits, Application procedure, interview venue of National Urban Health Mission NUHM Aurangabad Medical Officer, Staff Nurse, ANM 47 Govt Jobs Recruitment are given below. Total no of vacancies available in NUHM Aurangabad Recruitment are 47 posts. 1. Medical Officer (Full time): 01 posts. 2. Medical Officer (Part time): 10 posts. 4. Staff Nurse: 18 posts. - ANM: Rs. 8640/- per month. For Medical Officers: candidates must possess MBBS Degree from any recognized medical college and. See the notification for qualification details. Go through the AUHM Notification for age limit details. 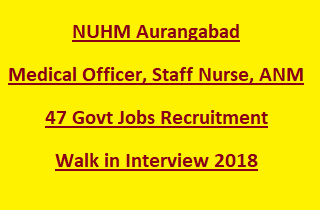 National Urban Health Mission NUHM, Aurangabad will conduct Walk in Interview to select candidates for Medical Officer, Staff Nurse, ANM vacancies. Walk in Interview dates: 19th & 20th January-2018. For Interview venue, please visit NUHM official notification. Interested and eligible candidates having prescribed qualifications may download the application for Medical Officer, Staff Nurse and other jobs using www.aurangabadmahapalika.org Website. Carry the completely filled application form at the time of walk in Interview.